She's Fantastic: Tetsuwan Tantei Robotack - MIMEENA! 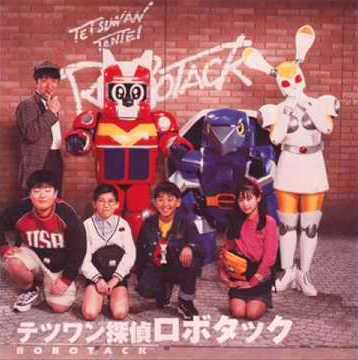 Tetsuwan Tantei Robotack - MIMEENA! I was trying to think a good Easter review when I remembered this goofy little beauty. Toei's Metal Heroes Series ran from 1982 through 1998 with a variety of (mostly) kid-oriented television programs. The most popular ones for US audiences were VR Troopers from 1994 and the Big Bad Beetleborgs from 1996. The Robotack series is the newest, but never made it to US Television. Tetsuwan Tantei Robotack is a sequel series to B-Robo Kabutack (from which I reviewed Tentorina last year) and was the 17th and final installement of the Metal Heroes Series. Mimeena is a bunny-themed robot who is in love with Kamerock, a turtle-themed robot and one of the two main characters. Their relationship is a Tortoise and Hare motif. Bandai released these figures in 1998 in Japan so they can be a bit diffiuclt to find in other countries. But if you can hunt them down, they make great quirky additions to any fembot collection. Let's check out Mimeena below! Her articulation is pretty good. The skirt limits some movement and her elbows are fixed in a very "robotic" pose. But other than that she's very flexible. I especially love that her ears are articulated. Mimeena comes with a variety of accessories. This toy lines is essentially a build-a-figure series and Mimeena comes with a tons of add-on accessories for this BAF. Her one true accessory is this AWESOME carrot sword. This was the only live-action picture I was able to find of her. Here she is with Tentorina. Wow, never heard of this one. She is quite adorable. I love finding obscure foreign figures. It's my drug. You know about Roswell Conspiracies - Aliens Myths and Legends? Was a really good Batman TAS-Bruce Timm animation style cartoon about a MIB style organization in a world where most mythical beings were actually various types of warring aliens, with humanity caught in the middle. They made toys, and I have some of the first wave, but the second wave is almost unknown. I do know toys of it exist, as I have two of them, but I don't even know who they are supposed to be (they don't look like any character on the show). a backer card for them would be useful.